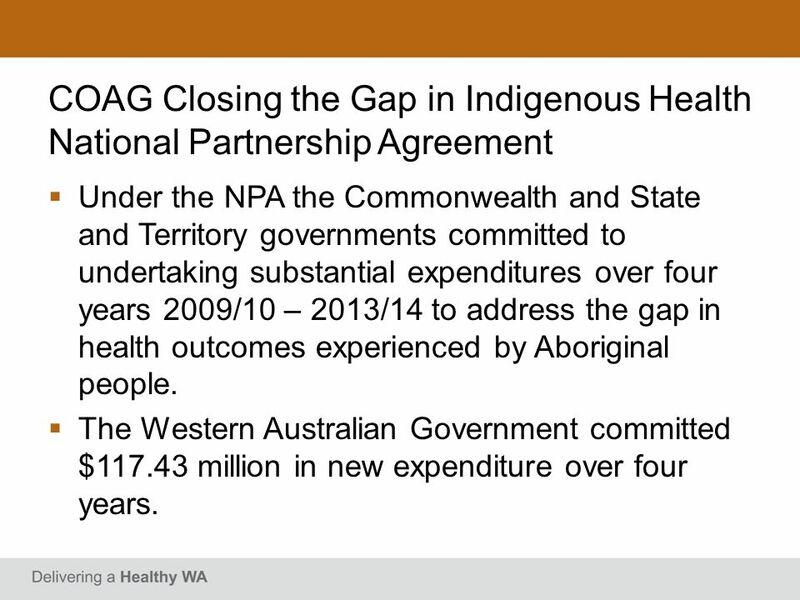 Under the NPA the Commonwealth and State and Territory governments committed to undertaking substantial expenditures over four years 2009/10 – 2013/14 to address the gap in health outcomes experienced by Aboriginal people. 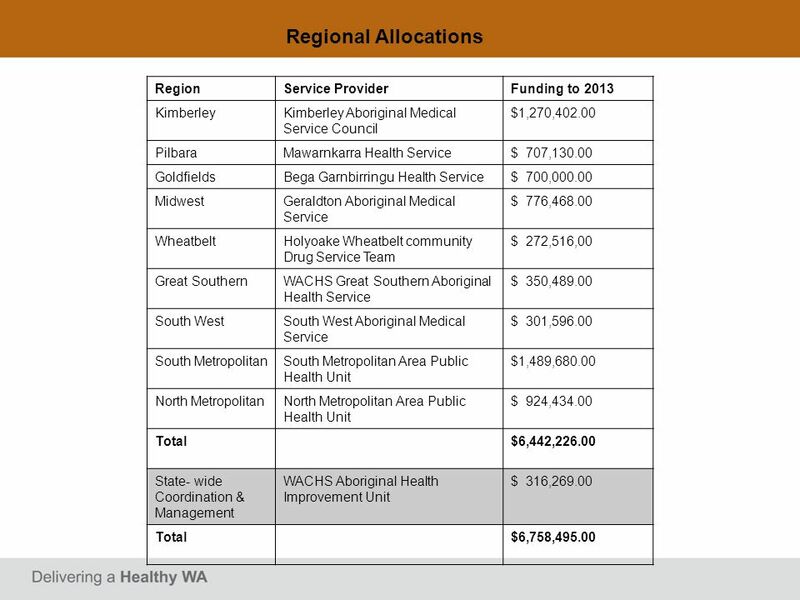 The Western Australian Government committed $ million in new expenditure over four years. 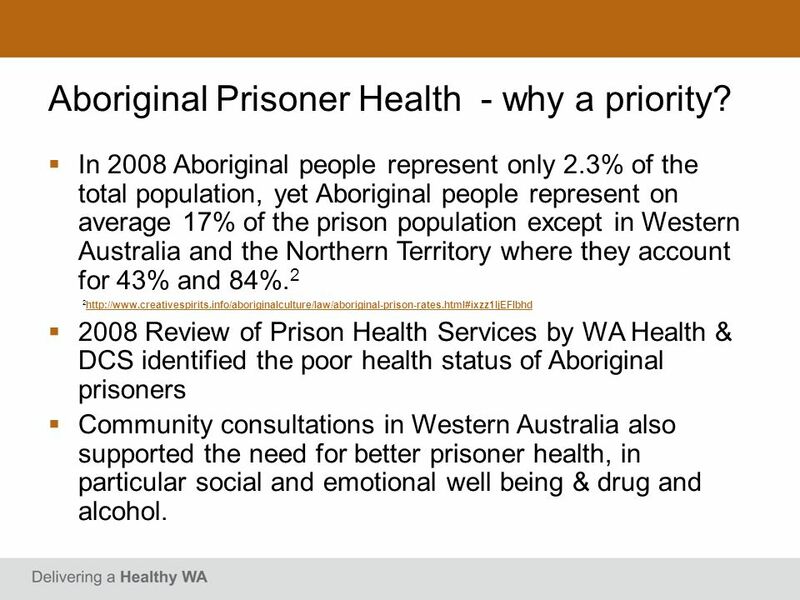 6 Aboriginal Prisoner Health - why a priority? 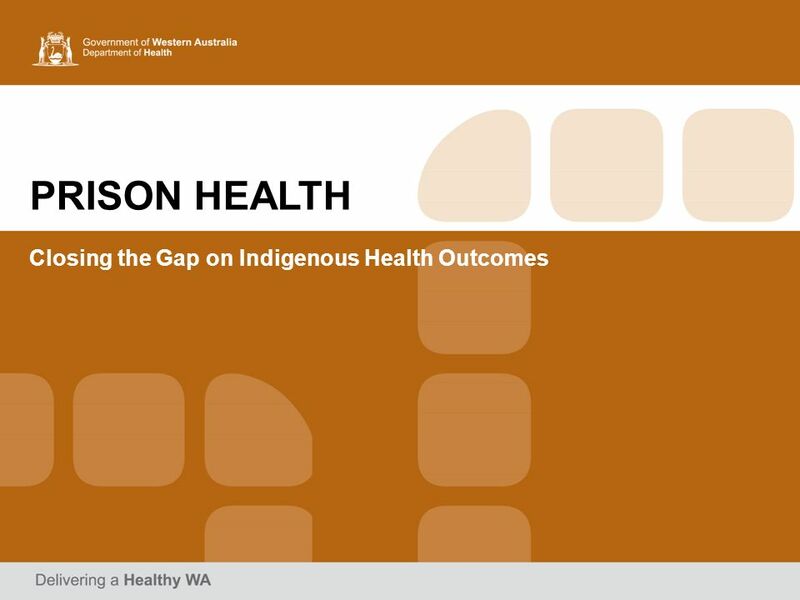 In 2008 Aboriginal people represent only 2.3% of the total population, yet Aboriginal people represent on average 17% of the prison population except in Western Australia and the Northern Territory where they account for 43% and 84%.2 2http:// 2008 Review of Prison Health Services by WA Health & DCS identified the poor health status of Aboriginal prisoners Community consultations in Western Australia also supported the need for better prisoner health, in particular social and emotional well being & drug and alcohol. 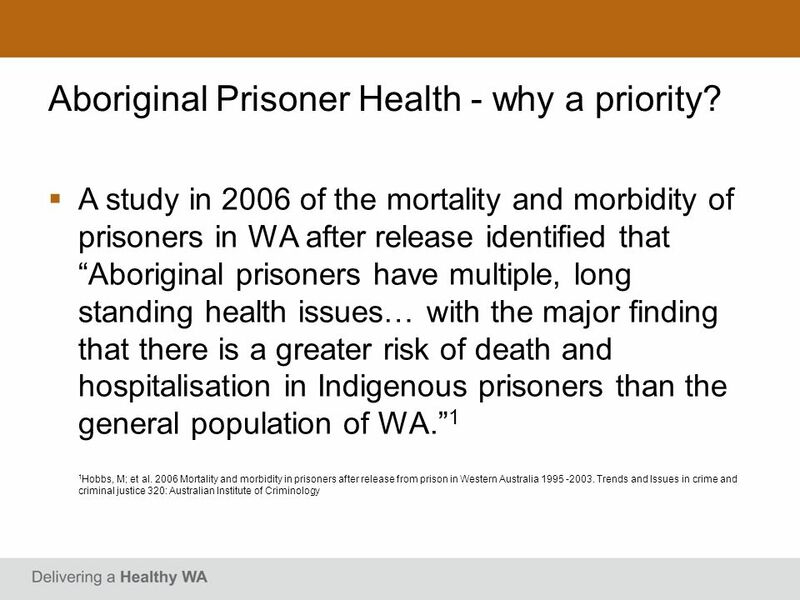 7 Aboriginal Prisoner Health - why a priority? 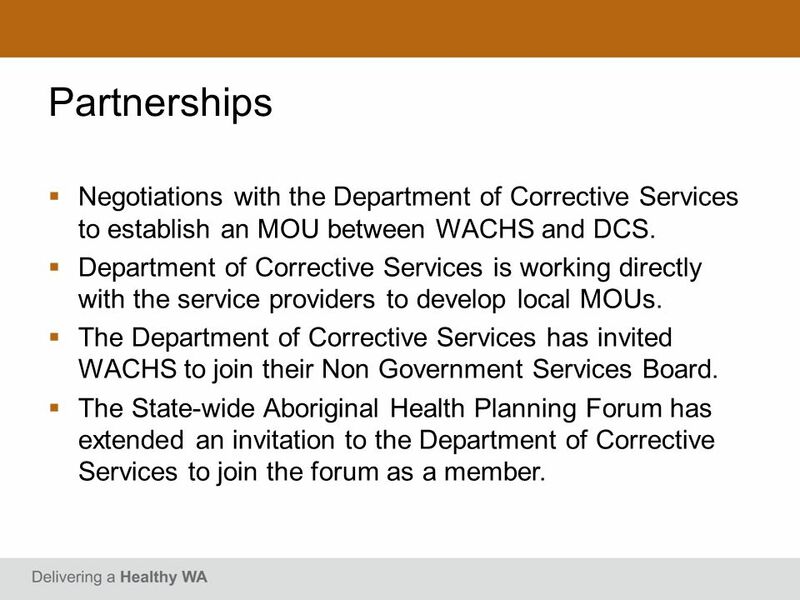 12 Partnerships Negotiations with the Department of Corrective Services to establish an MOU between WACHS and DCS. Department of Corrective Services is working directly with the service providers to develop local MOUs. 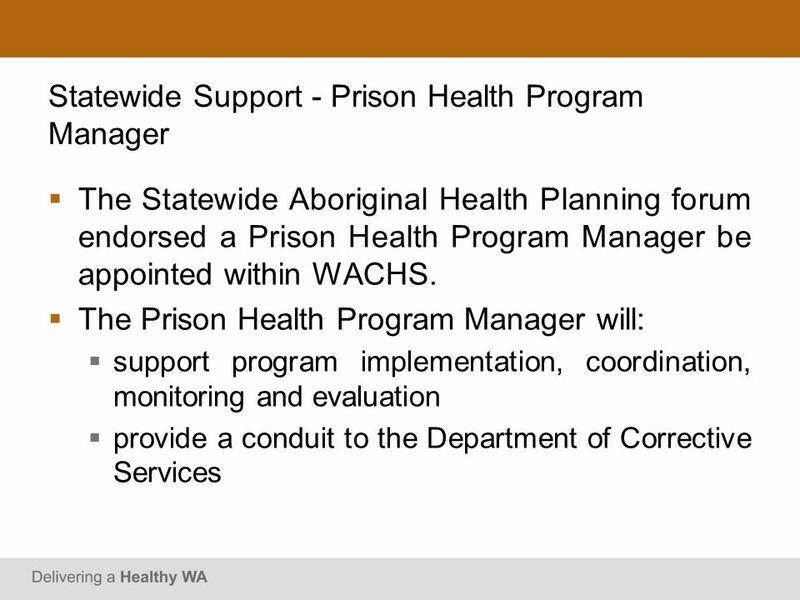 The Department of Corrective Services has invited WACHS to join their Non Government Services Board. 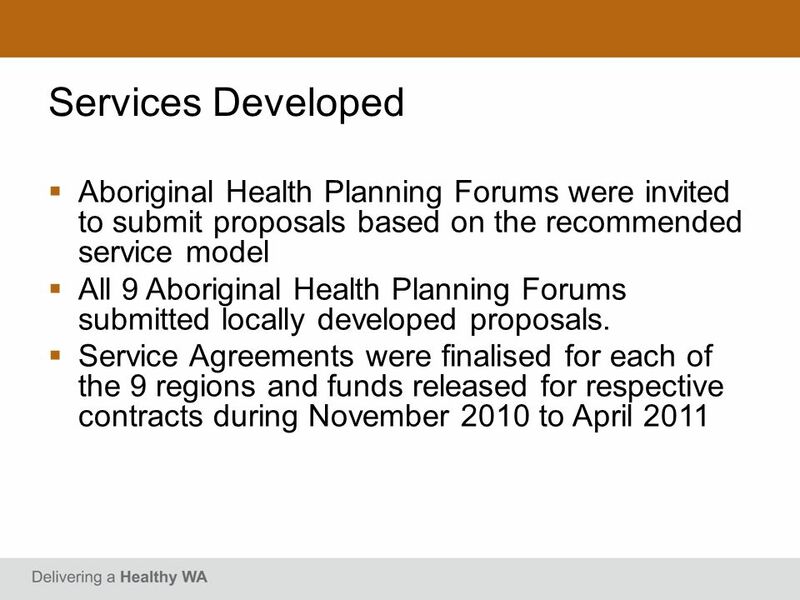 The State-wide Aboriginal Health Planning Forum has extended an invitation to the Department of Corrective Services to join the forum as a member. 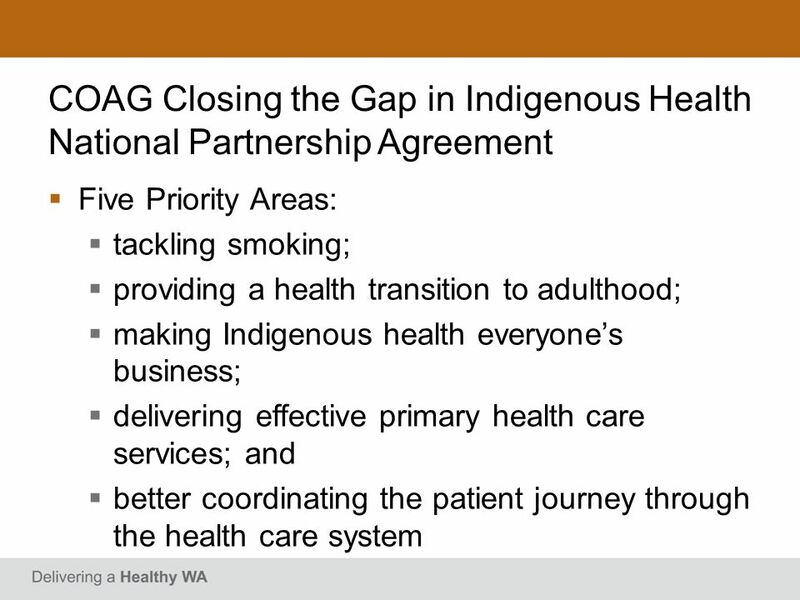 Download ppt "Closing the Gap on Indigenous Health Outcomes"
1 Florida Department of Corrections Update on Health Services Cost Containment Presentation to the Senate Committee on Criminal and Civil Justice Appropriations. 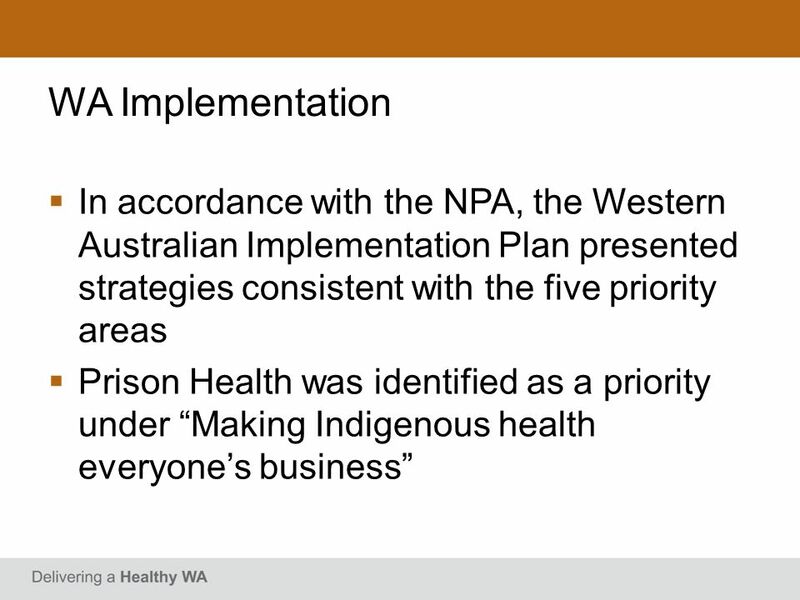 Sandy Austin Director Health and Aged Care North and Western Metropolitan Region NWMR Health & Wellbeing Implementation Strategy …the implications are. 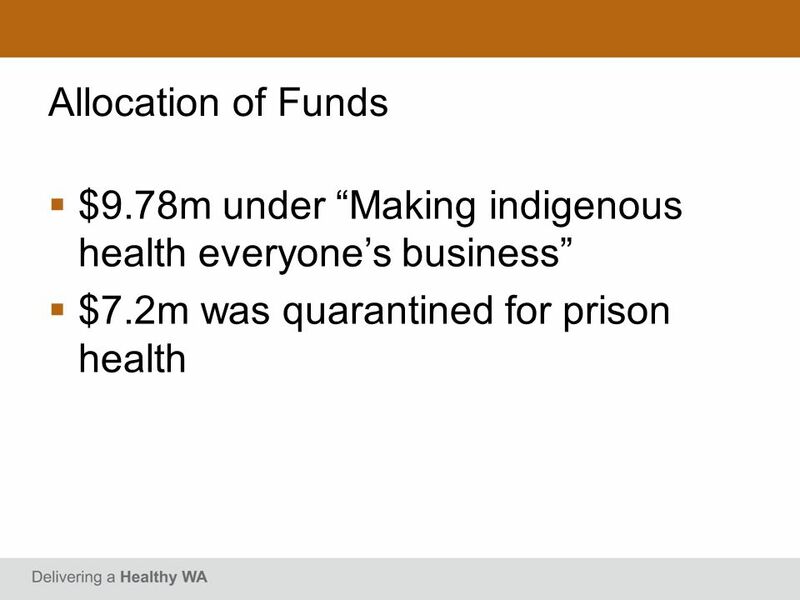 Public Research Funding in Health Emergencies – Australian Perspective and Strategies Clive Morris Head, Strategic Policy National Health and Medical Research. Neami Limited The Role of NGOs in the Provision of Community Mental Health Services. Opioid-Related Deaths and Mortality Rates by County, Wisconsin Residents Office of Health Informatics and AIDS/HIV and Hepatitis C Program Bureau. IMPROVING HEALTH AND PATIENT CARE THROUGH COMMUNITY PHARMACY - A CALL TO ACTION Tony Carson Pharmacy Advisor NHS ENGLAND London Region January 2014. Justice Reinvestment in the United Kingdom 30 th September 2013 Kevin Wong Deputy Director, Hallam Centre for Community Justice. A Ten Year Commitment. WELCOME Purpose of this presentation To outline Stronger Futures in the Northern Territory package: Steps leading up to August. Leading Transformation The Commonwealth Fund March 14, 2013 Steven Blumberg Senior Vice President and Executive Director AltantiCare Health Solutions. 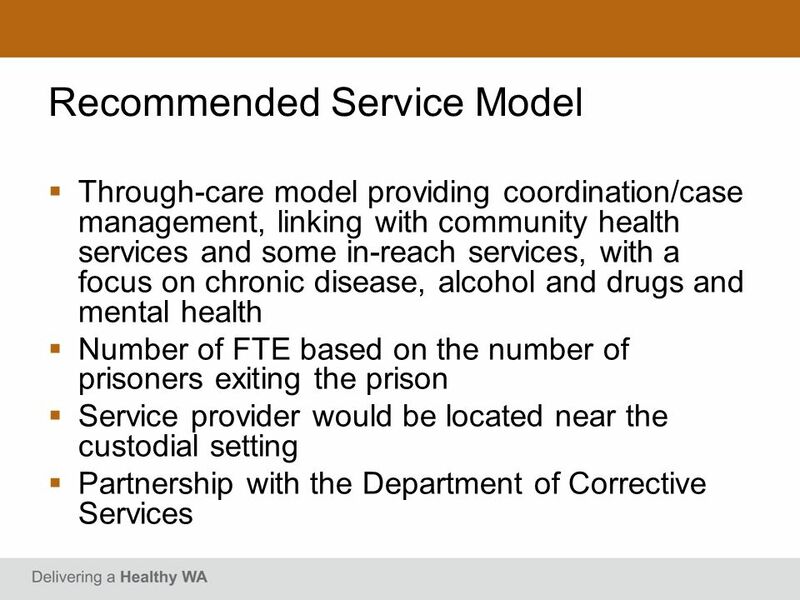 The health and socioeconomic needs of soon to be released prisoners: New information from the 2012 National Prisoner Health Data Collection Jenna Pickles. Delivering local health solutions through General Practice. Devon team CQC inspectors. 2 We make sure people get better care Who are we improving care for ? People who use services, carers and families People in.